The 2018 Mahindra Roxor is a purpose-built, off-road only 4×4 from the Indian automobile manufacturer, currently on sale in the United States of America. The Roxor is based on the India-spec Mahindra Thar but unlike the latter can only be driven off-the-road. It has been developed by Mahindra Automotive North America. What this 4×4 offers then a cheap to run and cheap to maintain go-anywhere package! So far there are no confirmations from Mahindra if this vehicle is ever going to come to India or not. Read more about it in our detailed report! In order to completely understand Mahindra’s move to produce off-road vehicles in the USA and their latest offering, the Roxor, we’ll have to take you down the history lane. Back in the 1940s, Mahindra started its life as an automaker by importing and assembling Jeep CJ3B under the name ‘Major’ in India. Licensed, of course. 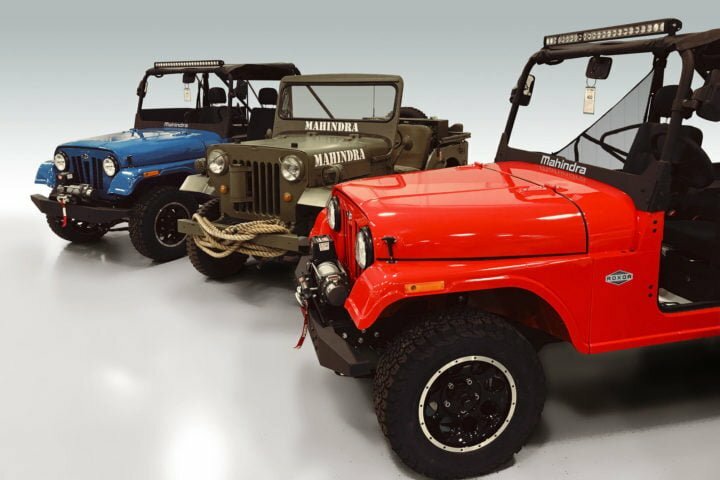 Mahindra assembled Willy’s Jeep model CJ-2A which is now offered as the Thar. Back in 1940, the Major used to come with two engine options, Peugeot derived 62 HP and 74 HP. Almost ‘Eight’ centuries later, essentially the same car, the same power, actually I’ll be Blunt here, its the same Jeep CJ3B with a modified front grille, tail section and the re-fuelling cap moved from under the taillight to the side fender. Why would you want to sell outdated(read ancient) stuff with 900 choices of exterior finish? Ever wondered why Mahindra’s front grille looks similar to that of the Jeep? The reason’s evident now. But, since Jeep holds more influence in the American auto market, Mahindra had to use an alternate design on the Roxor. Coming to the present day, the Roxor has its priorities set at being good off the road. Considering the Roxor off-road vehicle comes loaded with leaf-springs even at the front, you will be better off using it for off-road use only, sorry, its actually NOT ROAL LEGAL, in other words, strictly restricted for off-road use only. Also Read: – Upcoming premium MPV and SUV from Mahindra. The latest off-roader from Mahindra will not launch in India. 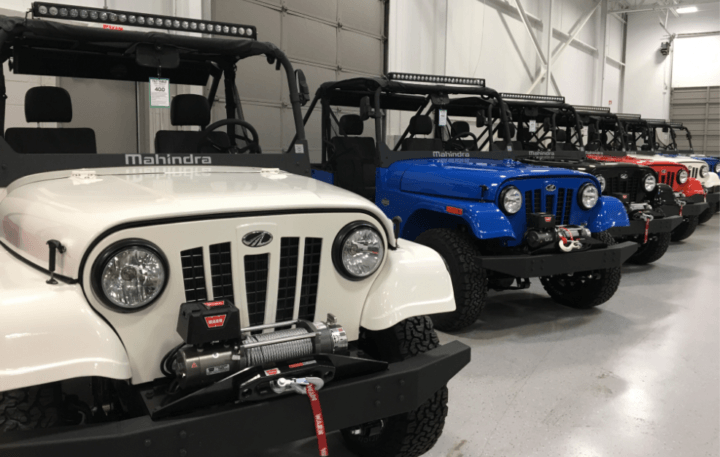 The 2018 Mahindra Roxor was designed in Detroit and is being manufactured at the Mahindra plant inaugurated last year. The reports suggest a starting price of $15,549 with the range-topping at $18,999. In Indian Rupee, this amount translates to INR 10.12 lakh and INR 12.37 lakh. I am not sure as to why I wrote the last line, it’s not even coming to India. Thankfully. Initially, the company released plans to manufacture electric off-road vehicles there for the American market and now they launched a Diesel engine from the 1940s tuned to work in 2018. Being part of the ‘road-legal’ platoon requires passing emission norms as well and Mahindra forgot to share the same. The 2018 Mahindra Roxor employs a 2.5-litre diesel engine churning out 62 HP at 3,200 rpm and 195 Nm at 1,400 rpm. The engine comes mated to a 5-speed manual transmission which is further connected to a low-range transfer case. Considering the engine has to carry the car weighing, 1,377 kg, passengers – 182 kg, load at rear – 158 kg (max) and a towing capacity of further 1583 kg totalling to 3,300 kg of total weight, 64 HP sounds understated and the top speed of 72 km/h overstated. Also Read: – This Mahindra Thar based Wanderlust is my new wallpaper. The new Roxor looks exactly like a Jeep from the 1940s. The rounded fenders up front, the design, the curvature of the hood and the shape of the door. What’s different is the tail section and the fuel cap being moved from under tail-light to the side fender. The front grille differs too. 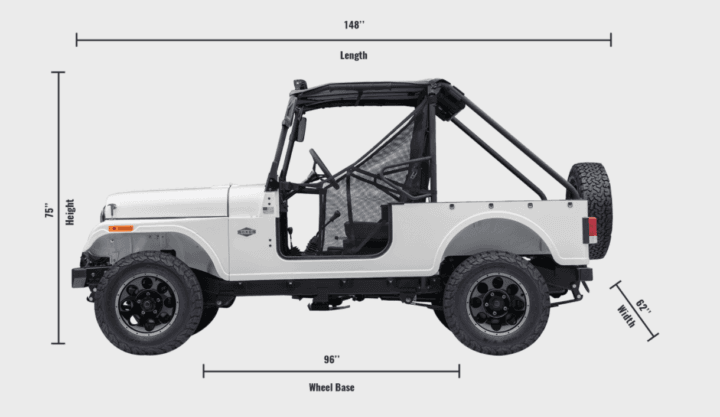 Comparing dimensions, the 2018 Mahindra Roxor features 3 inches longer wheelbase, gains 3-inch in height, a little narrower but the length is exactly the same. 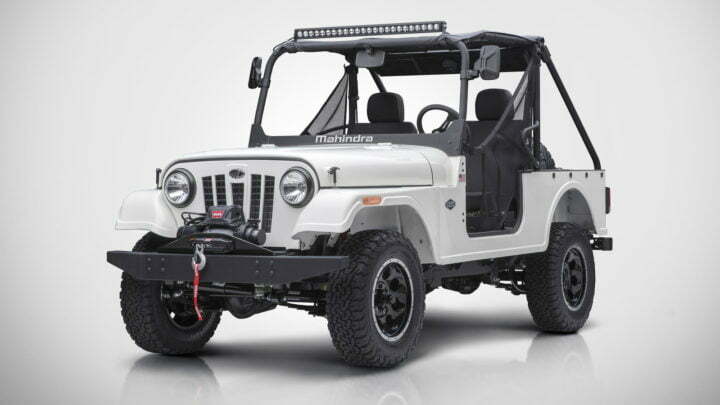 The new Mahindra Roxor features a steel body on a boxed frame, solid axles and leaf springs. The 2018 Mahindra Roxor spans in length, width and height by 3,759 mm, 1,574 mm, 1,905 mm. The off-roader holds a wheelbase of 2,438 mm and a minimum ground clearance of 228 mm. The Roxor employs leaf springs on both axles for suspension duty. The Mahindra Thar comes with at least an independent suspension in front.